A participant takes a turn on the bike-fitting assessment stand. I’ve been cycling in London for a few years now, but I recently decided to take the leap to do a longer cycling tour – from Amsterdam to Berlin this summer. However, I’d been having some lower back pain and wrist pain that had been niggling me; so, on October 4th I joined Hackney Bike Workshop for a bike fitting. The group provide bike fittings as part of their regular community cycle maintenance workshops. The workshops are an opportunity for participants to have their bikes fixed by qualified mechanics, and learn maintenance skills themselves. 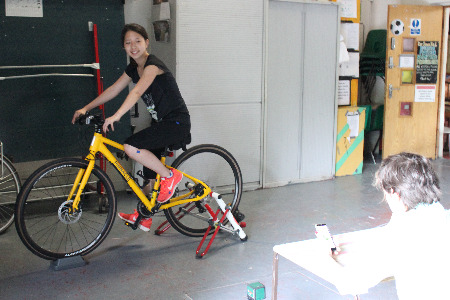 Hackney Bike Workshop recognises that ill-fitting bikes can have serious health implications, including back pain, chronic knee problems and issues with reproductive systems. Through offering bike fittings, the group aim to ensure cyclists have a comfortable and healthy riding experience. This helps encourage people to cycle more regularly, and continue cycling when they might otherwise give it up. Along with the maintenance workshops, the fittings contribute towards more sustainable cycling practice. I set my bike up on a stand, and a laser level was used to ensure the bike was straight and parallel to the floor. Measurements were taken of all parts of the bike, to create a record of my bike set-up at the beginning of the fitting process. I was asked to wear shorts or cycling tights, as I had to apply small bright stickers to the side of my hips, knees and ankles to make sure that the laser could map my movements precisely. I cycled in place on the stand. This information was sent back to the bike fitter’s phones via an App and they were able to see where I could make improvements in my body positioning, as well as any changes needed for my bike in order that it fits my body correctly and safely. Within minutes, the fitters at Hackney Bike Workshop had figured out that my saddle was too low (apparently a common problem), and I needed a few minor handlebar adjustments. Once all of the changes and adjustments had been made, my bike set-up felt brand new! I’ve not had any niggling pain since, I’m more efficient in my pedalling, and I feel much more confident on my bike overall. The whole process took about 2 hours. It felt amazing to have this private session with trained bike fitters. I got to ask all the questions I’ve wanted to ask about bike maintenance, and quiz them on how to feel correctly aligned in my body whilst cycling. The regular drop-in maintenance workshops attract at least 10 people in each session, with the 1-1 bike fitting service usually fully booked in advance. I’d recommend everyone with any aches and pains whilst cycling to reserve a session at this incredible service offered by the friendly and helpful folks at Hackney Bike Workshop.